LVS 9580 off-line bar code verification to ISO/IEC standards, is a high-performance handheld solution for off-line barcode verification to ISO/IEC and MIL-STD-130N standards. 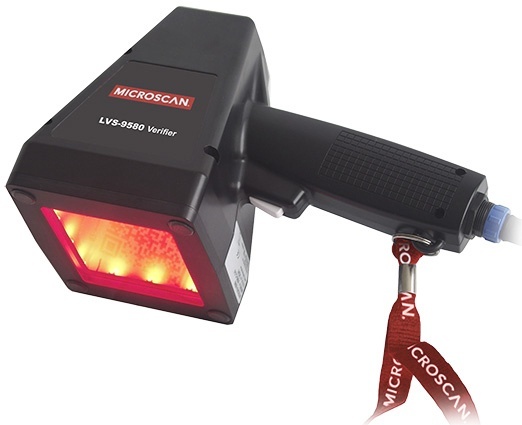 Featuring a high-resolution 5.0 megapixel camera, the LVS-9580 reads and analyzes linear (1D) and two-dimensional (2D) barcodes up to 3.0 inches (76.19 mm) wide and up to 2.25 inches (57.15 mm) tall. The LVS-9580 verifies multiple barcode types, including any combination of linear, 2D (Data Matrix, QR Code, and Aztec Code), and stacked linear (PDF 417, Micro PDF and Composite Codes). Contact us for a detailed list of supported standards and symbologies. • Inspection. Inspects all nine of the ISO (ANSI) parameters in linear (1D) codes, plus added features of determining blemishes and human readable validation. The LVS-9580 also verifies 2D codes (including multi-row and matrix codes) and reports all parameters as specified in the applicable ISO/IEC and MIL-STD-130N specifications. • Detailed Reporting. Analysis is colour coded to show exactly where the problem is located within the barcode, and sections of the barcode can be analyzed to determine how to solve the problem. • High-Resolution Inspection. High-resolution inspection of the barcode is possible due to the use of a 5.0 megapixel high resolution camera, which allows reading and analyzing every two thousandth of an inch (.002"/.05 mm) of the barcode height; this exceeds the minimum ten-scan average required by ISO. • Advanced Technology. Sensor technology allows more detailed analysis of the barcode, and makes reading of small and truncated codes possible, accurate and easy. • EAN/UPC NIST Traceable Calibrated Conformance Standard Test Card. The LVS-9580 is supplied with a NIST traceable calibrated conformance standard test card to ensure that the system is always within a known calibration standard. • The LVS-9580 was formerly known as the Integra 9580 by Label Vision Systems. EAN/UPC NIST Traceable Calibrated Conformance Standard Test Card: The LVS-9580 is supplied with a NIST traceable calibrated conformance standard test card provided by GS1 to ensure that the system is always within a known calibration standard. EAIV Software Upgrade: Enhanced Application Identifier Verification (EAIV) option verifies that all GS1 Application Identifiers, such as Expiration Date, Global Trade Item Number (GTIN), and Batch Number, embedded in the data structure of a GS1 barcode match the data programmed in the EAIV feature by the user.